The Cassini spacecraft has been orbiting Saturn since 2004, but it’s running out of fuel and will crash into the planet in September, 2017. In the meantime, it’s executing a fantastic series of maneuvers, diving repeatedly between the planet’s outer atmosphere and inner rings. This image was a Cassini highlight. The spacecraft acquired it in 2013 when it flew high above Saturn, looking down toward its north pole. It took a series of shots that were then assembled into this amazing mosaic by software engineer Gordan Ugarkovic. Saturn is the sixth planet outward from the sun and farthest planet that’s easily visible to the unaided eye. You need a telescope to see the planet’s wide, encircling rings, but Saturn is also fun to watch with the eye alone. It shines with a steady light and golden color. Follow the links below to learn more about seeing Saturn throughout 2017. When can I see Saturn in the first half of 2017? To find Saturn in 2017, look for the constellation Scorpius and bright Antares! Saturn is closest, brightest, opposite the sun on June 15. Where will Saturn be in the second half of 2017? A great time to see Saturn in May, 2017 – to learn to identify the planet – would be May 11, 12 or 13, when the moon sweeps near. Read more. When can I see Saturn in the first half of 2017? Saturn started this year in the morning sky, shining in the southeast before dawn. But, as Earth has moved in its orbit around the sun, Saturn has risen about 2 hours earlier with each passing month. In May, 2017, it’s rising in mid- to late evening. 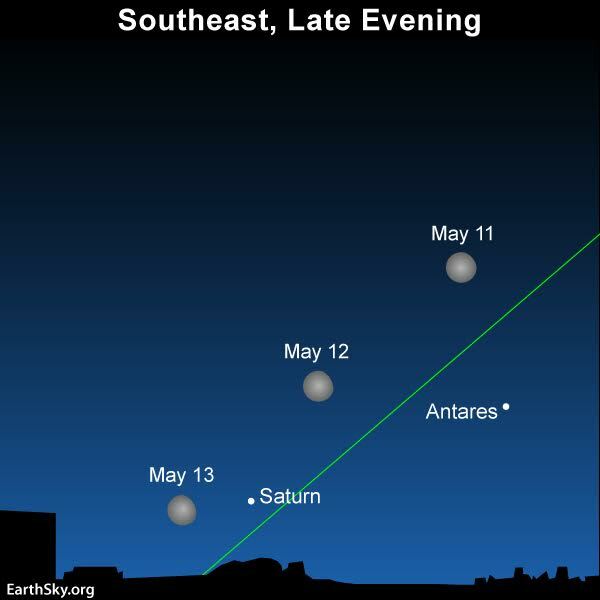 The final two weeks of May will probably present Saturn low in the southeast sky (assuming you’re in the Northern Hemisphere) before your bedtime. By mid-June, for all of us around the globe, Saturn will be out all night long, adorning the nighttime from sundown to sunup. To find Saturn in 2017, look for the constellation Scorpius and bright Antares! Throughout 2017, Saturn is in the vicinity of Antares, the brightest star in the constellation Scorpius the Scorpion. Saturn shines with a golden color, while Antares is reddish. 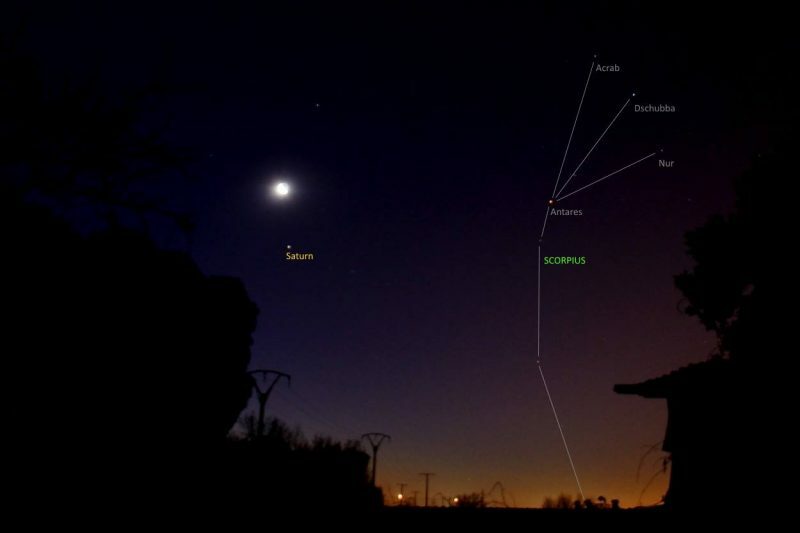 Want to identify the rest of Scorpius? It’s one of the few constellations that looks like its name. You can recognize the entire constellation for the graceful fishhook shape of the stars of the Scorpion’s Tail. 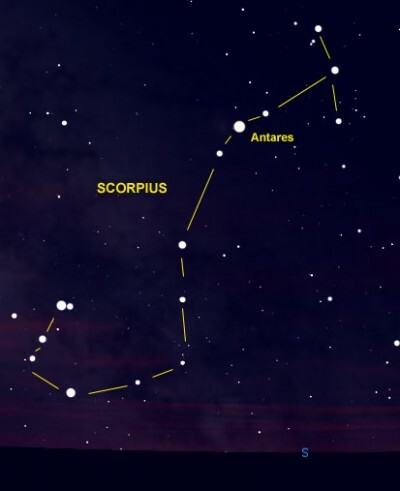 Antares is the bright star at the Heart of the Scorpion. Also notice three closely-knit, modestly-bright stars to the west (right) of Antares. These stars are an asterism – or very recognizable star pattern – known as the Crown of the Scorpion. View larger. | To verify that you’re looking at Saturn, look for the constellation Scorpius. You’ll recognize it for the curved Tail of the Scorpion. Saturn is closest, brightest, opposite the sun on June 15. On June 15, 2017, Earth will go between the sun and Saturn. Astronomers call this an opposition of Saturn, because the planet will appear opposite the sun in our sky, rising in the east as the sun sets in the west. June 15 – the opposition date – features the ringed planet at its closest to Earth and brightest in our sky. Saturn is the faintest of the bright planets. It’s still pretty bright, but, normally, you wouldn’t pick it out from among the stars. But around May or June of 2016, you can view Saturn fairly easily, because Saturn appears as bright as the brightest stars. Saturn shines even more brightly than Antares, the brightest star in Scorpius. 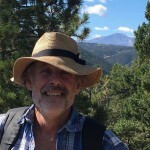 Because we will pass Saturn – the sixth planet outward from the sun – from an inside track around the sun, the ringed planet will look as if it’s going backward (retrograde) in front of the fixed stars of the zodiac for several months. In 2017, Saturn retrogrades – moves westward in front of the stars, in contrast to its regular, eastward motion – from April 6 until August 25. When Saturn starts its retrograde (westward) movement in front of the backdrop stars of the zodiac on April 6, it’ll be moving toward Antares. By the end of Saturn’s retrograde on August 25, Saturn will be closer to Antares than it presently is in the morning sky. 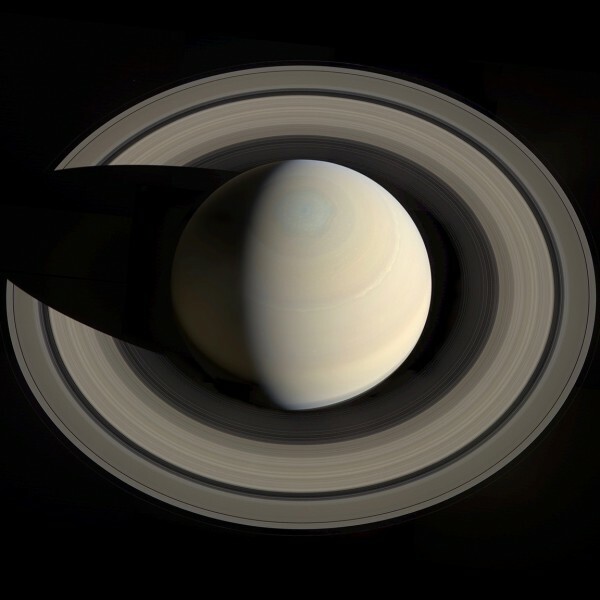 Saturn’s yearly opposition happens about two weeks later with each passing year. The 2014 opposition happened on May 10. The 2015 opposition occurred on May 23, and the 2016 opposition was on June 3. This year’s opposition takes place on June 15 and next year’s on June 27. So you see that Saturn – like most objects in the heavens – is really very orderly in its comings and goings in our sky. Once you learn to identify it, you can recognize it from year to year. Image not to scale. 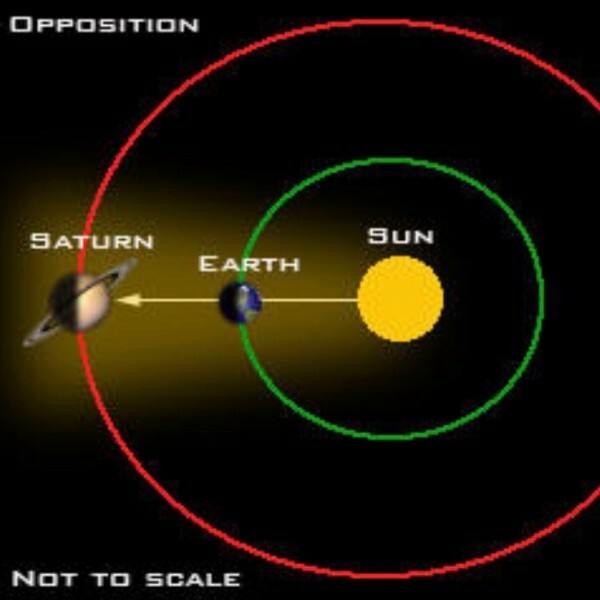 Earth goes between the sun and Saturn once each year, and that yearly “opposition” marks the middle of the best time of year to see Saturn. In 2017, Saturn’s opposition comes on June 15. Image via theakumalian.com. Where will Saturn be in the second half of 2017? Saturn is nearly always somewhere in our sky, for most of every year. In the second half 2017, as Earth moves away from Saturn in its orbit, we’ll see Saturn shift its location in our evening sky. After Saturn’s opposition in June 2017, Saturn will appear farther to the west as darkness falls each month thereafter. Finally, in late November or December of 2017, Saturn will disappear in the western twilight after sunset. One last thing, for you telescope users: from February 11, 1996, to September 4, 2009, the south side of Saturn’s rings was facing in Earth’s direction. Since then, we’ve been looking at the north side of the rings. Throughout 2017, the rings are inclined at about the maximum of 27o from edge-on, making 2017 an especially good year for observing the north side of Saturn’s rings. 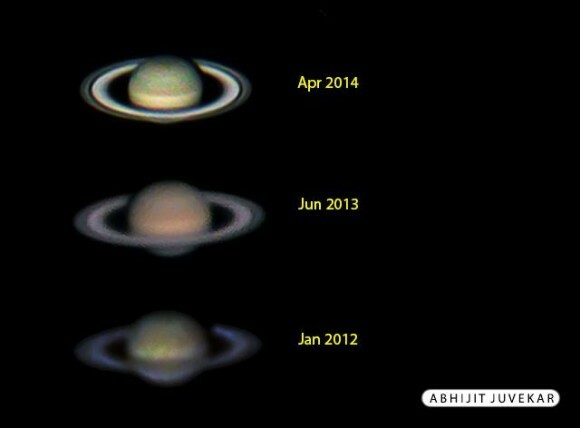 Saturn yearly observations comparison by Abhijit Juvekar. The rings are even more open in 2017, at a inclination of 27o on the opposition date of June 15, 2017. Saturn basics. Earth travels around the sun once a year, while Saturn takes about 29-and-a-half years to orbit the sun once. Earth’s orbit is smaller, and we move faster than this outer planet. So once a year, we pass between Saturn and the sun and gain another lap on the planet. You might realize from what we just said that Saturn is relatively slow-moving in orbit and, therefore, slow to change its position against the background stars. That’s why the early stargazers called it the oldest of the old sheep. Like all planets, Saturn is lovely to gaze upon. Its golden color is fascinatingly reminiscent of wonderful spacecraft photos of Saturn. It’s a real place, after all, not just a light in the sky. Plus, Saturn’s brightness waxes and wanes in a subtle way throughout every year, making it fun to watch. Can you see the rings of Saturn if you look with the eye alone? No, you need a small telescope to see the rings. But, to the unaided eye, Saturn will appear as a bright golden “star” … very beautiful. And unlike the twinkling stars, Saturn will shine with a steady light. That might help you identify it. Wow. It’ll be sad to lose the Cassini spacecraft. But 2017 will be its final year. This Cassini image is from December 18, 2016. 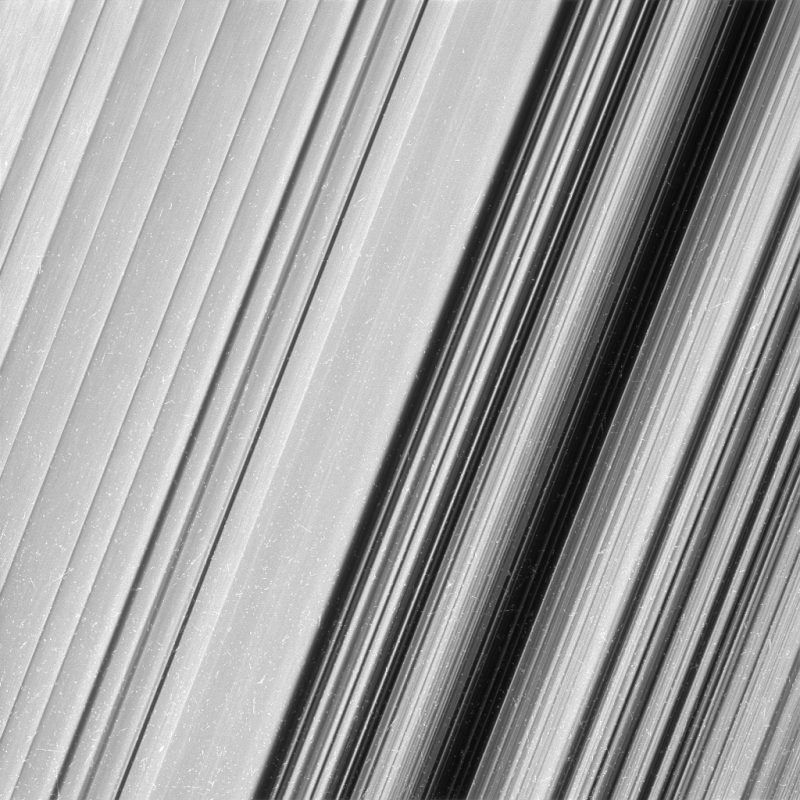 It shows a level of detail in Saturn’s rings twice as high as had ever been observed before. Image via NASA. Read more about Cassini’s epic final year at Saturn. Bottom line: The best time for viewing the planet Saturn in 2017 comes in June and July. The ringed planet will be at its brightest and in the sky all night, or nearly so. Why? Because we’ll pass between Saturn and the sun on June 15. Saturn can be found near the Scorpion and the star Antares. Enjoy!